As a regular visitor and reader of this blog, You must have come across our previous update, which was on the launched Virtual MasterCard. We made known to all its features and Benefits of using the card. This time, we will be guiding you on how to request for the Virtual MasterCard via the internet banking interface from GTbank. 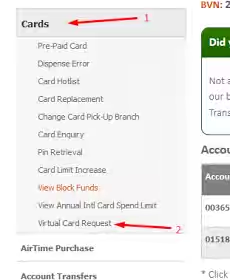 The Guaranty Trust Bank Virtual MasterCard is an online card that grant you access to pay with it, for any online transaction you did, provided, it is accepted on that platform of online stores. Getting the mastercard from GTBank internet banking is safe, secured and fast for all. Click here for the full details of this GTbank virtual MasterCard. ==>3. Now, by the left Navigation column of the viewed interface, you will see click cards, click on it and virtual MasterCard will follow in the drop down Menu. ==>4. Next, Click where you see "New Request"
Note: On request for the Card, You will be charged 525 NGN in other to complete the request. ==>5. Choose the particular Account which the requested application for the MasterCard would be debited from and also select the account which you want the MasterCard to be associated with. Do that, By clicking the box before it. That's all, enjoy. WE LOVE COMMENTS...DO YOUR BEST TO LEAVE YOUR COMMENTS BELOW.